Due to the near-death experience of my laptop, this post is much later than I had anticipated. But thanks to my husband it has been resurrected and I have access to the images just in time to post about Midsummer today. So…..in a country with long, dark winters, the summer solstice on June 21st is cause for celebration and Midsummer is second only to Christmas in Sweden. Complete with flower picking, may pole decorating, dancing, eating, drinking, and dreaming, it always falls on the third Friday in June and is an official ‘red day’ meaning most people have the day off. Midsummer is like a big ‘welcome to summer’ party that lasts an entire day. Most celebrations are held in small communities or at summer houses with family and friends and it is the start of a multi-week vacation for many people. The day begins with picking flowers and greens to decorate May poles and woman and children often wear flower crowns that can be created by braiding flower stems. 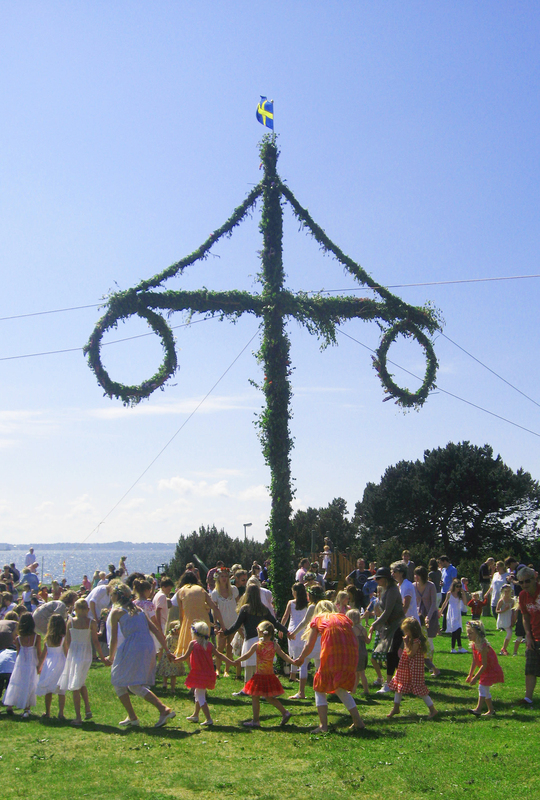 The May pole (majstång or midsommarstång) is an important part of the festivities. It is typically decorated with birch leaves and flowers and becomes the center of attention when dancing around the pole commences with Små Grodorna (Little frogs) being a highlight. It’s a surreal but lovely moment when you are holding hands with a flower-topped stranger, often a child, and dancing around a leafy pole. 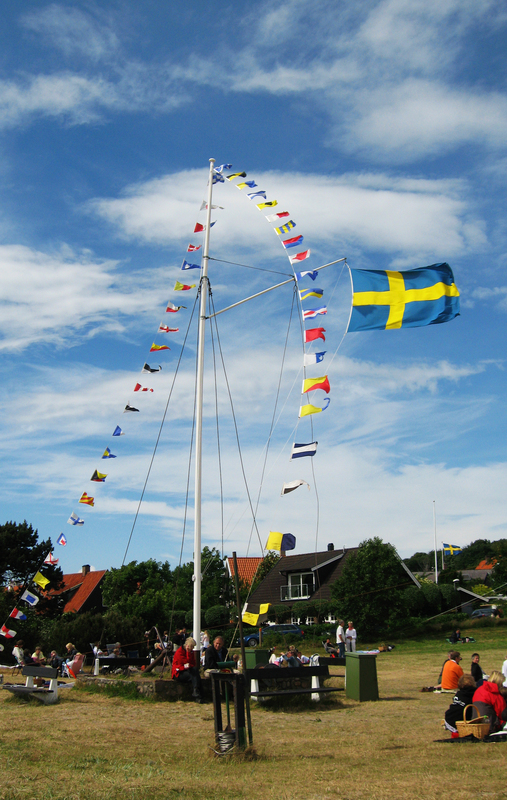 The May pole tradition immigrated to Sweden with a surge of Germans in the Middle Ages. May in Sweden was too early to have enough flowers and foliage to decorate the pole so it became adapted to Midsummer while maintaining the name of May Pole. It has become a symbol closely associated with Sweden. Legend has it that Midsummer is a magic day for love. On their way home Midsummer evening, if young girls pick seven different kinds of flowers and lay them under their pillow their future spouse will appear to them in their dreams. I had a long-standing misconception about the food for Midsummer. Before experiencing it myself, I heard over and over again the menu is typically herring served with new potatoes, sour cream, chives and strawberries. I found that combination incredibly perplexing until I understood that the strawberries were served with cream for dessert, not in combination with the herring. That was a relief, unless of course you are squeamish about herring and then you are nervous regardless because you will most certainly be met with some herring at a Midsummer gathering. The most traditional herring to be served at Midsummer is matjessill which is a rather complex herring pickled with cloves, allspice, ginger, black pepper, cinnamon, oregano, bay leaves, tomato, cognac and port. It is served alongside new potatoes and sour cream generously topped with chives. New potatoes didn’t become a typical part of the Midsummer meal until the 1920s. In earlier times it was considered a waste to harvest potatoes before they could become as big as possible. Serving potatoes from the previous year’s harvest signified you were well off enough to have plenty of potatoes in your cellar after the long winter. Herring is a long-standing staple in the Swedish diet and was available in even the poorest homes. It was not considered a special occasion food but similar to the turnaround for lobster, and salmon, times changed and an every day food became celebration fare. Sour cream is the portion of the meal with the most long-standing tradition. Pre-refrigeration and pasteurization, sour cream occurred naturally when the cream that was skimmed from fresh milk soured at room temperature. During the winter the cows were kept inside from the cold and had rationed food, but by Midsummer they were out to pasture and had calved. The milk was flowing again which made sour cream a celebration worthy food. Swedish strawberries are nearly cause for celebration in themselves. They complete the Midsummer meal with cream and a little sugar or on a strawberry and whipped cream decorated sponge cake. 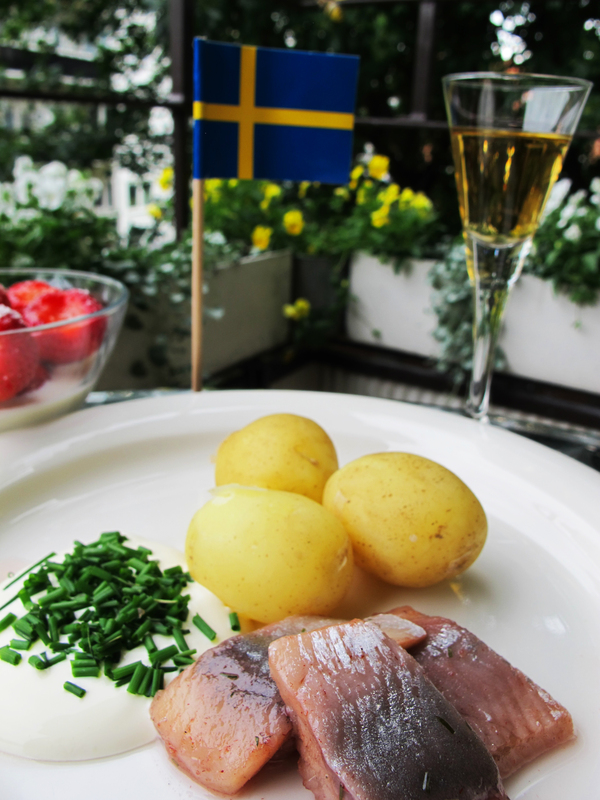 Aquavit also plays a significant role in the majority of Midsummer meals. It is a form of vodka between 40-45% alcohol content that is believed to aid the digestion of rich foods. Made from a potato or grain mash, there are a variety of natural flavorings from herbs (caraway is the classic) to elderflowers. A song often precedes tossing back a small glass of ice cold aquavit that is finished by saying ‘Skål!’ (sKOHL) and making eye contact with everyone at the table while the liquid burns all the way down to your gut. Midsummer is known for its unpredictable weather so it’s best to be prepared for cold and rain at some point in the day, but only the heaviest downpours will deter the festivities. Midsummer is magical with the daylight that lingers and lingers, particularly in the far north where the sun never sets and travels along the horizon. There is a run on dill, potatoes, and herring at the supermarket and long lines form at the strawberry stands. With the focus on being outside with family and friends, joyfully dancing in rings around the May pole singing, and sharing traditional food it’s easy to see why Midsummer is such a beloved holiday. It’s worth making the effort to join in a celebration if you have the opportunity. And if you want more tips about how Swedes celebrate Midsommar, check out this entertaining video. 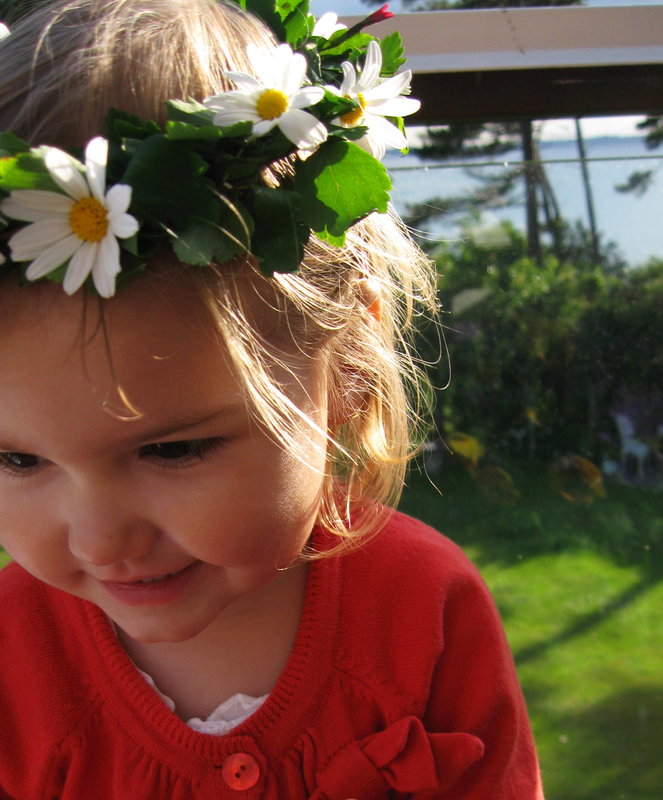 Glad Midsommar! Sounds like a lot of fun. Its the first couple of days here that haven’t been punctuated by rain and cold. My garden weeds have shot up dramatically with the warmth and the garden plants that have survived are striving to try and catch up with them. Thanks for keeping up these posts. They are fun to read. That’s a wonderful post. Makes me want to be there.